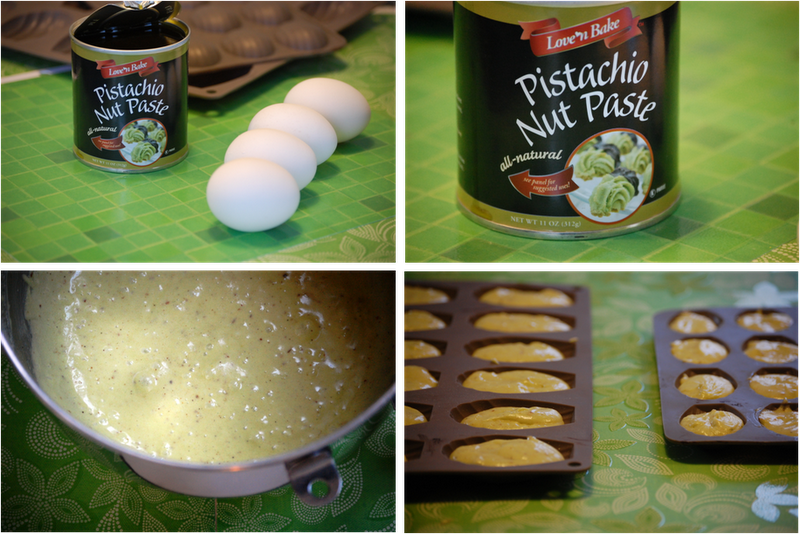 The Cooking Blog of Emilie French Chef: Green Pistachio Madeleines ... you will be nuts about them !!! Green Pistachio Madeleines ... you will be nuts about them !!! When I was a kid, I just loved these French Madeleines you can find in all the supermarkets, with a chemical taste of Almond extract (do not blame me, I said I was a kid !!!). The original recipe is made with Lemon zest or Orange Blossom Water, but of course, you can go behind the rules, and use other flavors. Because I am not that conservative-minded, and because Patrick's Day is around the corner and I decided to green up my Madeleine, with Pistachios. BUT, one thing that I needed to get with my Pistachio Madeleine is : THE BUMP !! You can enjoy your Madeleine(s) for the "petit dejeuner" (breakfast) or for the "gouter" (afternoon snack) or just right out of the oven when they are still warm .... yum yum !!!! I recommend a non stick silicone Madeleine mold. But if you only have a regular steel mold, generously butter your pan. With an electric stand mixer, beat the eggs and sugar until you get a light yellow color (around 3mn). Beat in Pistachio Paste. Add flour, Almond Meal, yeast, baking powder and Extract. In the microwave, melt the butter 20-30sec, until it is really soft (not too hot). Gradually add soft Butter in the mixture and beat on high until everything is blended. For the BUMPS : cool your mixture for 30-40mn in the fridge ! It is because you will put a very cold batter in a very hot oven that you will get the bumps !! After 30-40mn, preheat oven at 400°F. When the oven is preheated, put 1 tablespoon batter into each indentation in pan (dont fill up more than 3/4 of each indentation). Bake about 10-15mn (depending on the size of your molds) until you Madeleines are puffed and brown, about 16 minutes. Cool 5 minutes. Gently remove from pan. These were amazing. Thank you so much for sharing the recipe. I've never seen yeast used in a madeleine recipe before...why does the recipe call for yeast? Is it "instant" yeast or the traditional yeast that you use?